In early 2017, we released the Classy 100, an annual list of nonprofits who grew on Classy in 2016. To find out what made some of these organizations so successful, we dug into the strategies that catapulted them into their growth. Number 21 on the list, Three Roots International, is an organization with an entirely volunteer-run staff in the U.S. 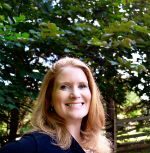 Here, executive director Susan Conway shares the two areas of focus that launched them into a successful year, and all of the details behind their growth. Three Roots International exists “to cultivate community development by empowering families through education, health, and income-generating activities.” Specifically, their programs address the “multi-dimensional” poverty faced by 88 percent of the population in Ethiopia. In an effort to create a sustainable impact that lives beyond their organization’s services, Three Roots International needed to think big as it made its goals for 2016. What could they set out to achieve that would have a lasting impact on the people they serve? The organization realized this traced back to the activation and empowerment of their own supporters. “We’re trying to reduce any barriers people would have to engage with our work, and we’ve found that Classy has really helped us to do that. From this connection, their overall strategy was born. “Our goal in 2016 was to optimize our use of the Classy platform in order to create the easiest and most streamlined experience for our generous supporters. Within this goal, we focused on launching effective peer-to-peer campaigns, and building our community of monthly partners through our THRIVE Partner campaign. By focusing on these two main growth levers, their volunteer-run leadership team of 12 increased their overall year-over-year revenue by 44 percent. This additional revenue now fuels the strategic expansion of their programmatic efforts. Peer-to-peer fundraising on the Classy platform served as the perfect tool to develop a personal connection between the organization’s supporters and those in need in Ethiopia. Anyone who wants to go to the field can apply to Three Roots International and fundraise for their trip. The application process allows the leadership team to assess the person’s interest and commitment. Upon approval, the team gives the applicant a helpful manual, complete with a fundraising section, that brings the individual up to speed on what it means to be involved in the team. Beyond this process, Three Roots International also needed a way to quickly mobilize support from their larger community. To this end, they launched their first targeted peer-to-peer initiative in the third quarter of 2016. “We did a large peer-to-peer campaign to fund the operating cost of a school in the community in Ethiopia, which was scheduled to close on the first of January. Through the very generous support of our donors here in the U.S., we were able to keep the school open and we are now rehabilitating and renovating it. In a matter of weeks, the leadership team launched this campaign and mobilized fundraisers to raise around $7,000. After seeing this success, they plan to launch similar initiatives in the future. They believe the campaign was so successful because of a certain key component. In monitoring and supporting their fundraisers, the organization realized their efforts really paid off when they paid special attention to a fundraiser as they reached two-thirds of their fundraising goal. Because Classy makes it so easy to see fundraisers’ progress, Three Roots International saw that more donations tended to roll in the closer a fundraiser came to crossing the finish line—a phenomenon referred to by psychologists as the goal proximity effect. Given this effect, Three Roots International focused on offering additional support around this milestone. Whether they provided additional coaching or social media messaging support, they made sure their fundraisers felt empowered to cross the finish line. “It’s really about strategically checking in with folks throughout their campaign, and then offering them advice for how to increase their donations and then thank their supporters. Learn more about how you can support your fundraisers as they approach their goals. The second area of focus for Three Roots International was their THRIVE Partner Program. Designed to generate a reliable source of income to their programs, this recurring revenue program helps meet urgent needs in Ethiopia. In order to attract monthly donors, Three Roots International uses thoughtful, tailored language on their THRIVE landing page. In this phrase, the mention of not only maintenance but expansion lets potential members know that their contribution helps to not only sustain work, but to further it. Here, visitors know their monthly contribution would go beyond an automatic payment. When they become a THRIVE partner, they enter a community of passionate individuals banded together to complete a mission. Perhaps most vital of all, this phrasing lets visitors know that as a member, they receive exclusive content that demonstrates the sustained impact they generate. In fact, THRIVE members receive photos and video messages from the field, personal thank you notes, and a special gift at the end of the year. Three Roots International even tries to meet with their local monthly givers face to face whenever possible. But when they receive support from farther away, they rely on human touches and professional photography to help potential and current THRIVE members connect with their work on a more personal level. In 2017, Three Roots International plans to explore how they can further develop their storytelling work in order to connect supporters to the work being done on the ground. The organization is also very intentional with an ask of $20. “For less than the cost of a dinner out, once a month, you can provide education, health, and economic freedom to families in Ethiopia. We find that people are really generous about doing that when they think about how little it requires of them to invest that. To promote their program and convey its importance, Three Roots International connects their recurring giving program to pressing need campaigns throughout the year. For each initiative, the main call to action is to sign up as a monthly donor. Three Roots International makes sure that signup is as easy as possible, so they don’t lose anyone after they’ve decided to join. Classy also offers features that protect their program from donor attrition. “Something that’s really, really helpful for recurring giving is that people can go in and modify their credit card information right away. That’s a little thing that really, really matters because when a credit card is compromised from fraud and people have to go back in…we all know how annoying that is. We find that Classy makes that easy for folks, and that has really helped us a lot. From 2015 to 2016, Three Roots International grew their annual revenue by nearly 44 percent. And as for their online revenue raised on Classy, 2016 saw a 660 percent increase in dollars raised. 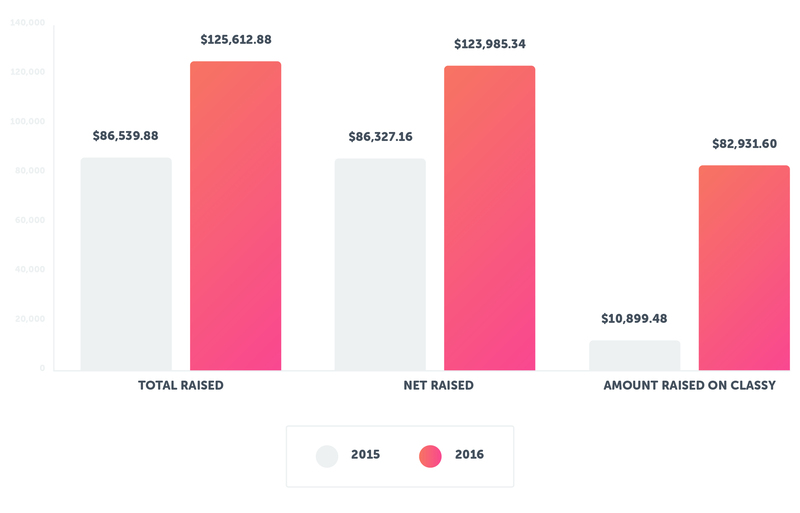 Thanks to their focus on their peer-to-peer and recurring revenue programs, the top contributor to their growth in 2016 was their increase in the number of donations received. Additionally, the team outperformed the baseline average of monthly revenue raised on Classy five months out of 12 in 2016. This incredible growth would not have been possible without strategic execution and the right tools in place. Conway did extensive research on the various platforms available before they made a buying decision. The organization wanted software that would not only fit their needs, but was also highly credible, and they felt Classy demonstrated credibility in both its number of users and client roster. Three Roots International knew that in today’s age, people are motivated to give online and often communicate through their social media networks, so the organization needed to invest in a product that would remain at the cutting edge of fundraising. “It has been key to our fundraising success to be able to demonstrate [to our team] that Classy integrates really well across social platforms, and that there are functionalities that allow people to feel not just connected to our work, but connected to one another. When Three Roots International considers the future, they’re excited by their momentum, but are sure to keep their strategic hats on through that celebration. 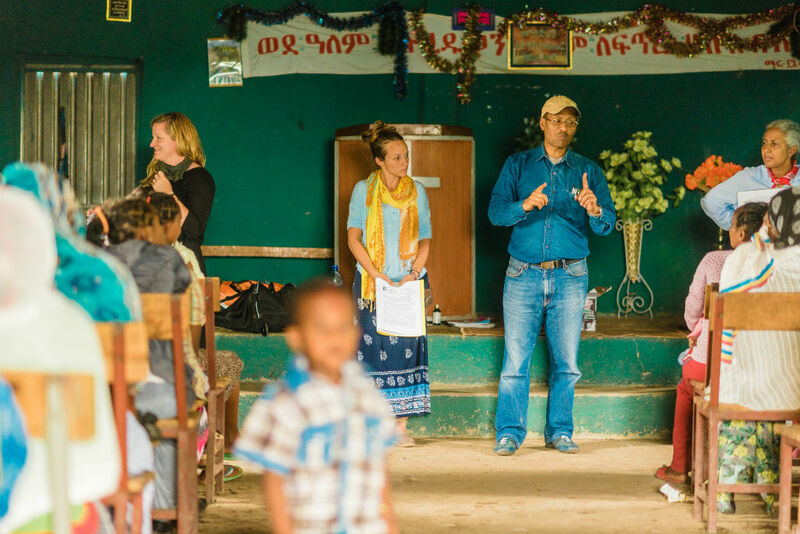 As they grow to have a larger impact in Ethiopia, they plan to maintain their culture of volunteerism. They know equipping and empowering volunteers to participate in their mission will always be important to their organization, no matter their size. “I think sometimes the mistake that organizations make is when they grow really quickly. They neglect to build the support structure they need to fuel the mission in the field, so one of the things I think about is how we are growing the work in the field and then balancing that by having the support in the U.S. to really grow the mission effectively. Growth is glorious. But it can also overwhelm an organization that’s ill-prepared to scale their work. To ensure your growth is purposeful, think through how your development goals relate to your larger initiatives, and ensure you have the right technology and know-how in place to support you. Three Roots International keeps their main goal top of mind in their journey to impact as many people as possible. Want to grow your revenue like Three Roots International? Dig into the Classy 100 for data and insights from organizations just like yours. Download the free associated resources and make your plan to achieve similar results today.